The O-CHCP Program will ease the regulatory burden that comes with managing compliance requirements. This is an online, self-paced course. You decide when and even where to take it. Registration fees: $399 member / $499 non-member. 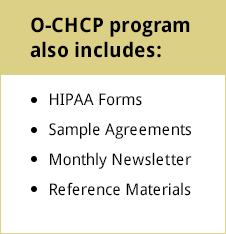 HCP is a leading compliance innovator in the orthopaedic industry when it comes to HIPAA and ensuring healthcare entities and their business associates remain compliant.